Remember back when you would drive to a place that you'd never gone to before, that if you didn't know exactly how to get there you would ask for directions before you left home, and the person giving you the directions would basically guide you there by listing a series of landmarks? (Once you get on such and such street, come down about five lights and turn left by that McDonald's.) Then remember when MapQuest came along on the Internet and you would enter the address of wherever you were going, print out the directions, and take them with you? And remember when GPS devices started to become really affordable, so you bought one, placed it on your car's dashboard or windshield, and would get real-time, turn-by-turn directions to your desired destination? And finally, mobile phones started coming equipped with GPS built in, so now you could just hop in the car, type in or speak the address to where you're going, and get turn-by-turn directions. I've gotten so used to my phone instructing me on where to go. Haven't you? Well, today I was on my way to a meeting in Concord when I encountered a large "ROAD CLOSED" sign on Harris Road, which is the name the road changes to after being Eastfield Road, near the Charlotte-Concord line. According to my GPS, I was only about five minutes from my destination, but thanks to the road being closed, I couldn't continue on the suggested route. And no matter how many nearby streets I tried turning on so that my GPS could recalculate, in hopes of it leading me in another direction, it kept pointing me back to Harris Road. 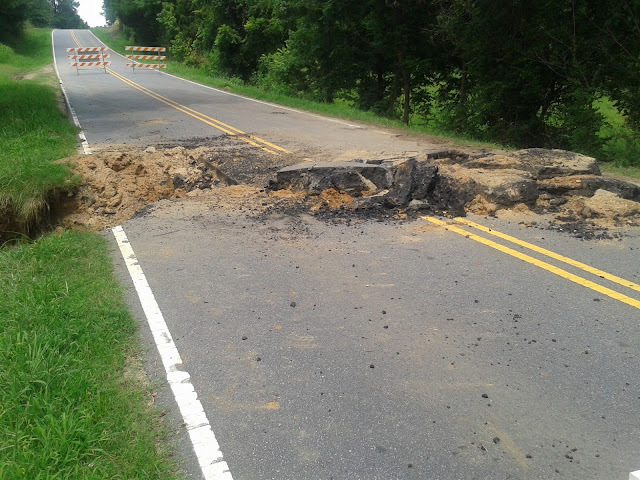 I wanted to scream: "I can't go that way because there's a sinkhole!" 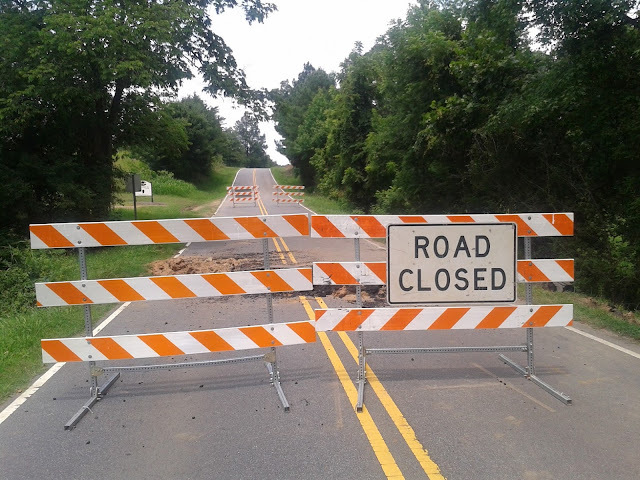 I'd seen and read about numerous sinkholes popping up throughout the Charlotte area over the last several weeks, largely caused by all of this rain we've been getting. Today was my first time encountering one in person. It was relatively small compared to some of the sinkholes I've seen on the local news (and pales in comparison to sinkholes seen around the world), but it was big enough to stretch across--and force the closing of--the two-lane road. In order to get to my meeting today, one of the guys I was going to meet with ended up having to give me old-fashioned directions over the phone, by listing a series of landmarks. I look forward to the day when my phone's GPS has an "avoid sinkhole" button. #1stWorldProblems.